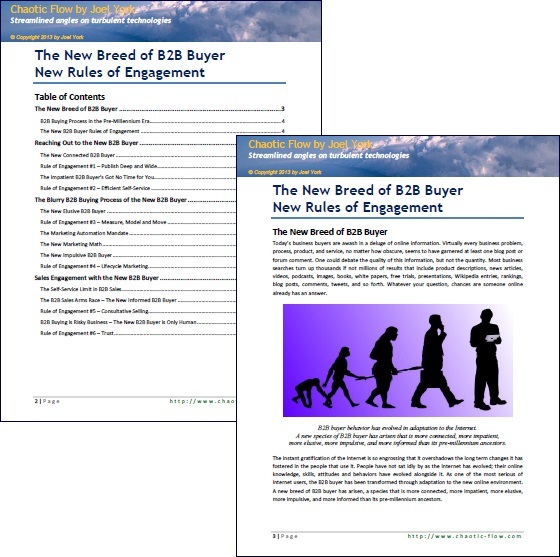 The New B2B Buyer | 6 Rules of Engagement eBook! B2B buyer behavior has evolved in adaptation to the Internet. A new B2B buyer species has arisen that is more connected, more impatient, more elusive, more impulsive, and more informed than its pre-millennium ancestors. Just as the new B2B buyer has evolved in adaptation to the Internet, B2B sales and marketing professionals must adapt their strategies and tactics to the expectations of the new B2B buyer for online independence and instant gratification. For each new behavioral trait that differentiates the new B2B buyer species from its pre-millennium ancestors, there is a new rule of engagement that complements that behavior to maximize B2B sales and marketing effectiveness. This eBook consolidates and expands on my popular New Breed of B2B Buyer series. It defines 6 behavioral traits of the new B2B buyer and explores how they lead to 6 new rules of sales and marketing engagement. It also introduces the concept of the “fuzzy funnel” and includes tactical highlights such as the evolving roles self-service, search, marketing automation and B2B sales in new B2B buyer engagement. Share and enjoy!